When we planned our Viking River Cruise from Budapest to Amsterdam, we thought about a lot of things, including what to pack, what expeditions to take, and what museums to visit. One thing we never thought about was how many locks our Viking Longship would pass through on the journey. 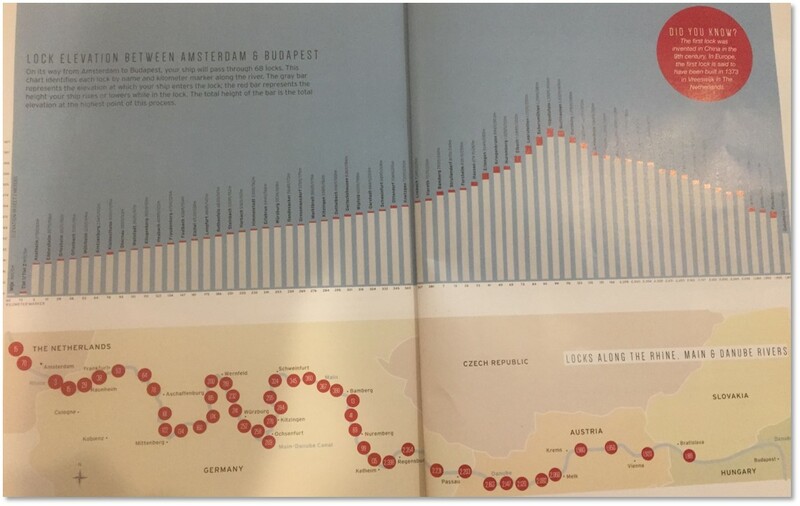 Logically, of course, I might have realized that the Danube and Rhine Rivers traverse uneven topography .These differences in elevation have to be compensated for by a system of locks. If asked I could have said that the Rhine flows north while the Danube flows south and streams flow in different directions on opposite sides of a mountain. But that’s it. 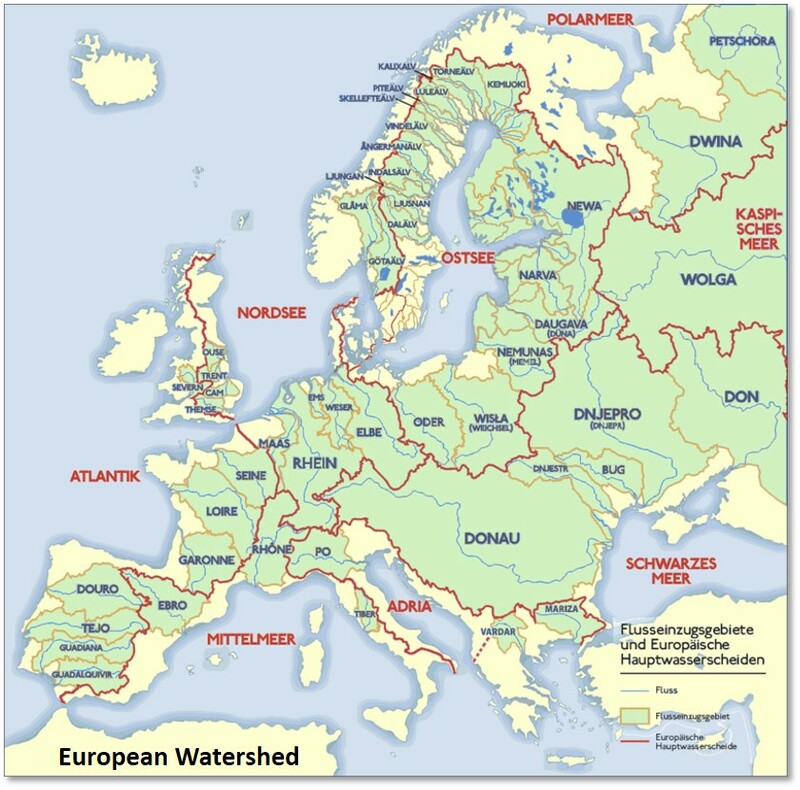 I didn’t know about the European Watershed: It just wasn’t on my radar screen. I was surprised to discover that, because of the European Watershed, Viking Modi would pass through 68 river locks along the journey. First, we would go up from Budapest to Hipoltstein and then we would go down to the Low Country. Woo-hoo! That added a whole new dimension to our linear trip. This drainage divide separates the basins of rivers that flow into the Atlantic Ocean, the North Sea, and the Baltic Sea from those that drain into the Mediterranean Sea, the Adriatic Sea and the Black Sea. Again, perfectly logical. The Danube River flows into the Black Sea (Aha!) while the Rhine empties into the North Sea. The two are connected by the Rhine-Main-Danube Canal. So we had to go up, over the top of the watershed and down the other side. Got the picture? 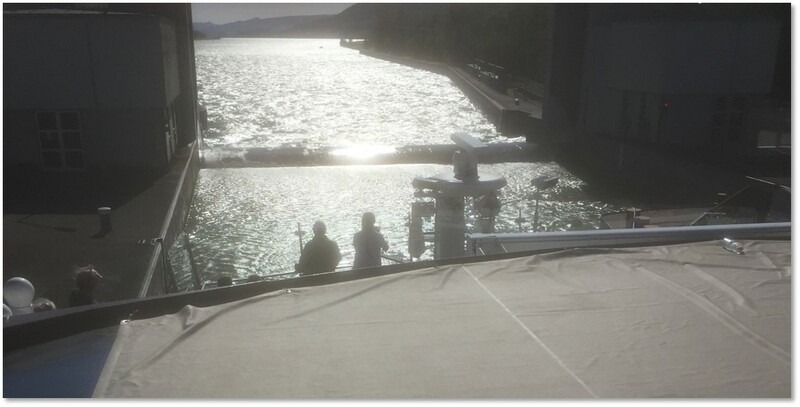 To cross over the European Watershed, Viking Modi rose from an elevation of 380 feet / 116 meters at the first lock at Gabcikovo in Hungary to a peak of 1,332 feet / 406 meters at Hipoltstein in Germany before dropping us back to 161 feet / 5 meters at Wijk in Holland. The tallest river locks were on the Rhine-Main-Danube Canal, at the peak of the European Watershed. Our Program Director, Mieke, explained that we would find this process interesting for about the first 14 locks and then it would become routine. I always found it interesting and the really big river locks exciting. The first indication of approaching a lock comes when your Longship slows from its usual smooth glide. That may or may not be followed by a small bump. The skill with which our captain and crew handled the 433-foot vessel never ceased to amaze us all. Viking Cruises makes its lock reservations a year in advance but the Lock Master runs the show and determines what happens at the gate. Sometimes we had to wait for another boat to come along so they could put two of us through at once—which conserved water and energy. At other times—usually at night—we zipped through because we hit the locks just right, like when all the traffic lights ahead are green. In the big river locks, we went through alongside other river cruise boats, commercial barges, and a few smaller ships. 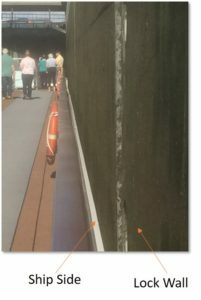 Now picture two enormous vessels fitting side by side into a long, narrow concrete trench and you have an idea how good the Viking crews are. 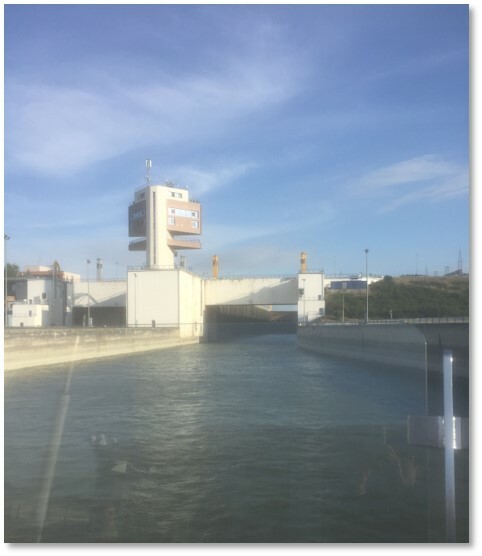 Once the ships are in the lock, the gates close behind them and the pumps go to work. Smoothly and quickly the vessels rise from the bottom of the concrete lock to the top (or lower from top to bottom). We could watch the elevation markers and ladder rungs move down as water filled in and we finally reached the top of the lock. Then the doors at the other end would open and we would power out into the next level of the river or canal. Some of the river lock doors swing into niches in the lock wall. Some pull sideways into the lock structure like pocket doors. And some raise and lower. I enjoyed going up more than down because it was more enjoyable to emerge from the dark empty lock into bright sunshine at the top and see a whole new stretch of sparkling water ahead. We didn’t get to experience all 68 river locks. Viking Modi went through many of them while its passengers were sleeping. Sometimes we would wake up to find our cabin totally dark with a concrete wall two inches away from our veranda railing. This sudden darkness could take us by surprise if we were eating and looked out to see lock wall instead of river. 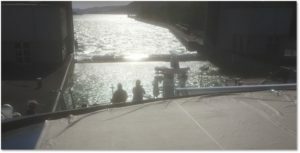 I watched us go through some of the river locks while I was doing Yoga on the Sun Deck in the morning before breakfast. We cruised through others while I sat talking to friends on the Aquavit Deck at the bow of the boat after dinner while the sun set slowly and lights came on along the bank. At the Ybbs Lock just north of Melk in Austria, I stood on the Sun Deck and watched water blowing off the top of the lock gate ahead of us and shining in the sun as we rose to meet it. I kept thinking how much my Dad, the engineer, would have loved doing this. He would have been taking pictures with his movie camera and talking to the crew whenever he could. Experiencing the European Watershed with its 68 river locks added another dimension to our Grand European Cruise. I love learning and experiencing new things; it adds to my enjoyment of Viking river cruises . I usually focus on art, history, and museums but I enjoyed the engineering component as well. I guess I’m my father’s daughter.